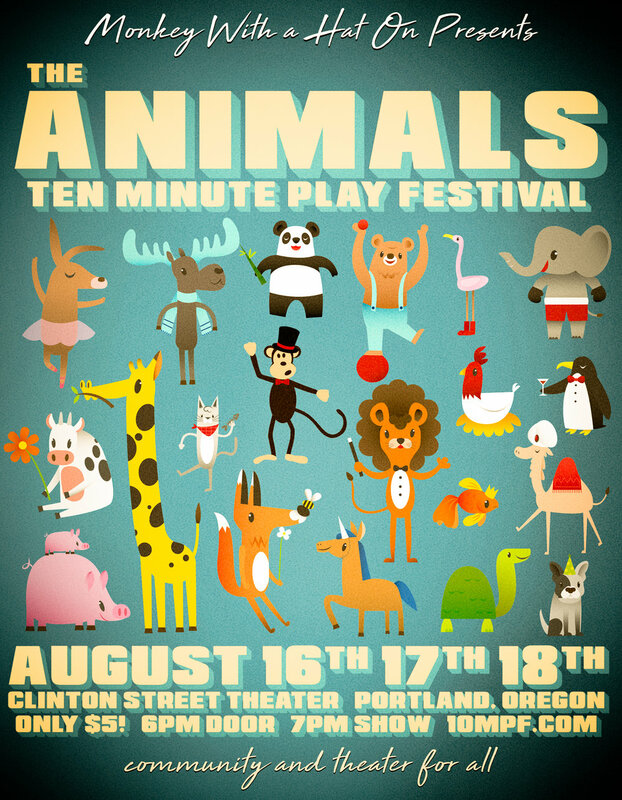 The Portland Ten Minute Play Festival is a seasonal collaborative event created by Monkey With a Hat On. The festival features a dozen locally written ten minute plays. Each play features different writers, actors and directors – many people are involved. The festival is a seasonal opportunity for Portland artists to share moments, and for the audience to experience a wide range of stories in one night. It’s a young, fun, festival atmosphere! For our seventh festival, all plays are Animals themed! The plays range in tonalities, styles and the interpretation of the theme. Think: on a safari with your crazy uncle, killing the dog next door, a whale's thoughts on the weather, three grooving blind mice, an intergalactic neighborhood association that chooses the fates of species, an ape going mad from finding a mystical artifact, and more! Also, we are encouraging the audience to dress up in animal costumes. Come on down wearing your bunny ears, masks, leopard print, feathers, or any animal-like attire. It’s going to be grrrrrrrreat!